Fiction – eBook; Harper; 317 pages; 2008. I never planned on reading Andrew Gross’s The Blue Zone but when I found myself stuck on a plane for eight hours I was desperate for some light relief. I flicked through my Sony Reader and came across The Blue Zone, which had been preloaded when I received it, so thought I’d give it a try. Under normal circumstances I normally avoid these kinds of plot-driven books with thinly drawn characters and cringe-inducing dialogue because I find them a complete waste of time. But it wasn’t always this way: I read plenty of best-selling crime thrillers of this ilk in my early 20s before I got bored with their lack of “substance” and moved onto more challenging literature. Reading The Blue Zone was a not so subtle reminder that my tastes have changed enormously over the past 15 or so years. I hesitate to describe the book as dreadful, because it does have quite an entertaining if totally preposterous plot, but it does come pretty damn close to being one of the worst books I have read this year. I can’t say I am surprised. Andrew Gross is the co-author of many of James Patterson’s best-selling thrillers, and the one and only time I read any of Patterson’s work — a free chapter taster that came with a daily newspaper a few years ago — I hated it, so much so I vowed never to read anything by him because I didn’t want to waste my time when there were so many other better written novels vying for my attention. I should have made that same vow for Gross. Through a series of twists and turns and completely unexpected changes in plot direction, the narrative moves along at an exhaustive pace, and the ending, when it comes, is almost laugh-out-loud funny because it’s far from credible. 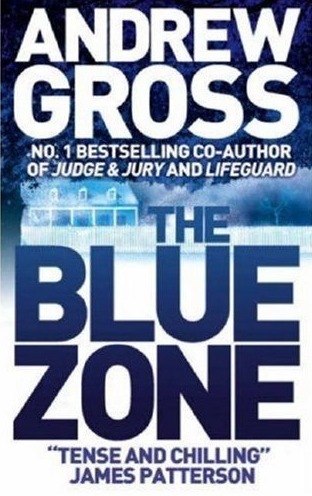 I’m sure The Blue Zone — the title refers to the FBI’s code for a blown cover — would make a superb blockbuster movie. Indeed, much of it does read like a screenplay. But as a book it feels too sensational with its overly engineered plot and shallow characters, and for that reason I can’t give it more than two stars. This is one for die-hard fans of this genre only — and even then the most skeptical of you will probably struggle to enjoy it on the basis the story is so farfetched. Mental note: this will be the first — and last — Andrew Gross novel I will ever read. Thanks for the warning. I actually slogged through an entire James Patterson thriller once, gave it one star and vowed never to get near a JP novel again, only to make the same mistake again a mere six months later by reading The Da Vinci Code – because I was afraid I might be missing out on a great read. Stupid! Anna, can’t believe you slogged through a Patterson, but good on you for perseverance! Hehe. I, too, read the Da Vinci Code only because I’d read a really BAD review and I couldn’t quite believe a novel could attract such wrath. Then I read it and realised that the reviewer was absolutely spot on! Ironically, it’s what made him – the association with JP – that puts me off and I will not bite. It may be good, it may be far more than decent, but AG in the arena of JP makes me think of mass-produced toilet paper. I can’t begin to feel tempted to try this author and I know it’s a product of my own prejudice, sadly. Had he got into print without the association of JP, I’d have been more open. As he feels like a “squished-out offspring” to me, I’ll make some room. But we also have to remember that this author may indeed have been the one to support and develop the JP brand over some years. Keep the mind and all options open, I say. Just in case. And read with an objective mind. I only know about Mills & Boon because characters in my favorite British novels and mysteries read them! 🙂 But I had a great conversation a few months ago with a new friend (also a reader) and we agreed that people who read as much as we do are entitled to read whatever we want. I read some “I know, I know, I know” books too…but on the other hand, you’ve got a great list of authors in your right-hand column. I’m glad to see you loved Sallie Vickers’ books – I just discovered her and she is now high on my list as well. Audrey, just to set the record straight I do NOT read Mills & Boon books — there’s several preloaded on my Sony Reader. I would rather stick hot knitting needles into my eyes than read such trash. Glad you’ve discovered Salley Vickers, she’s wonderful, isn’t she? I found The Blue Zone to be BY FAR the best book I’ve ever read. I’m for sure going to read all of Gross’ books!